We told you about this one in our last Digest, see: Digest 9 and here’s the letter we have sent in: GoBike Celtic Park Event parking letter 290518 We are hoping that they might just use the reduction in traffic on London Road to widen the footways and extend the existing short segregated cycleway from Bridgeton back into the city and east out to what some know as paradise! This was in last time too (see: Digest 9 ), and it’s been suggested that we propose a Dutch-style roundabout arrangement for each location (see a proposed layout for Eastwood Toll above), with each car lane separated from the adjacent one as it approaches and leaves the roundabout, to allow people walking or cycling to cross one lane at a time. Roundabouts are particularly treacherous for cycling and these sorts of measures are needed if they are to be improved. Below is a similar layout for the Spiersbridge roundabout. Back in April and mentioned in our (Digest 7) there was consultation on the East Dunbartonshire Council website about proposed parking restrictions around Lenzie Station. EDC have now issued by paper post, the formal Traffic Regulation Order (see EDC Lenzie Station parking ) and we’ll be responding favourably. We feel this brings in sensible restrictions, such as parking at, or opposite junctions (ie those areas banned for parking in the Highway Code), but do let us know if there are concerns about any of this, and do get your views in as per the letter from EDC. The Council propose to consider the introduction of the above named Traffic Regulation Order. Please find enclosed a copy of the press notice of the proposed Order, relevant map, statement of reasons, and detailed report. Details of the proposals will also be available on the Glasgow City Council website at www.glasgow.gov.uk/proposedtro . As stated in the attached documentation, any person wishing to object to the proposed Order should send details of the grounds for objection in writing to Projects Manager, Project Management and Design, Land & Environmental Services, 231 George Street, Glasgow G1 1RX or by e-mail to land@glasgow.gov.uk by Friday 15th June 2018. 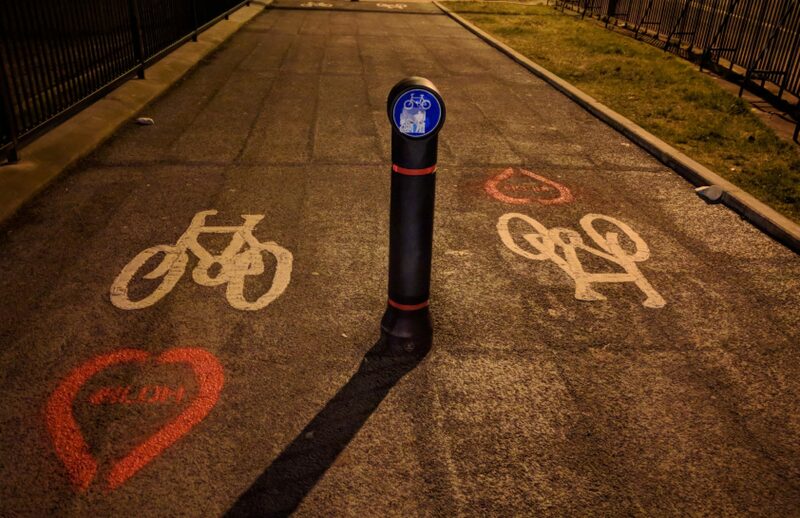 We objected quite strenuously back in the day when the awful one-way system was brought in around the SEC, so please look at this and let us have your views – does it improve things for cycling or not? We’ve had a look and here’s our proposal worked up by one of our members. We’ve not yet sent this in, but feel it’s much better than currently proposed. Here’s an email that we got from Glasgow City Council on 08 May. Sorry about the delay in publishing it, but it was overtaken by our Tea Break event on Saturday 12 May and the two SCW related consultation events on Monday 14 and Tuesday 15 May. The Council propose to consider the introduction of the above named Traffic Regulation Order. Please find enclosed a copy of the press notice of the proposed Order, relevant map, statement of reasons and report. Details of the proposals will also be available on the Glasgow City Council website at www.glasgow.gov.uk/proposedtro . As stated in the attached documentation, any person wishing to object to the proposed Order should send details of the grounds for objection in writing to Group Manager, Land and Environmental Services, Exchange House, 231 George Street, Glasgow, G1 1RX or email land@glasgow.gov.uk and it must be received by Friday 22nd June 2018. Our response hasn’t been submitted yet, but based on our attendance at the consultation event on Monday 14 May we are quite happy with what is proposed. There’s still plenty of time to get your views in, so please do. We hope that you will support this segregated cycle route, the first in Glasgow along a high street environment. The 20mph net is extending, and this time it connects to the City Centre 20mph zone, which is a plus. Let’s hope, over two years since the signage went in for the city centre, that when it extends out along the Gallowgate and London Road we get some enforcement! The Council propose to consider the introduction of the above named Traffic Regulation Order. Please find enclosed a copy of the press notice of the proposed Order, relevant map, statement of reasons and detailed report. Details of the proposals will also be available on the Glasgow City Council website at www.glasgow.gov.uk/proposedtro . Our reply will probably be along the same lines as our Woodside response, although we do think zebra crossings should be put in across Greendyke Street to help active travellers cross into Glasgow Green, but do let us know if you have any concerns. Please find enclosed a copy of the press notice of the proposed Order, relevant map, statement of reasons, detailed report and FAQs. Details of the proposals will also be available on the Glasgow City Council website at www.glasgow.gov.uk/saferparking from 9.00am on Thursday 24 May 2018. As stated in the attached documentation, any person wishing to object to the proposed Order should send details of the ground for their objection in writing to Andy Waddell, Head of Infrastructure and Environment, Land and Environmental Services, Exchange House, 231 George Street, Glasgow, G1 1RX or by email to saferparking@glasgow.gov.uk by Monday 25 June 2018 . TRO_2015_004-003 Hyndland, Hughenden & Dowanhill West (Publication) 2 of… 11.01 – Publication of Proposals – Press Notice – FINAL (ADVERTISED 24.0… 09.02 – Frequently Asked Questions 09.01 – Draft Report 08 – Statement of Reason If you need a better copy of the first 2 documents you will need to go to the city council website – they were too large for our wordpress site and we have adapted them. We are generally in favour of controlling parking, but if you live or work in this area do let us know what you think. The consultation will run from Wednesday 23 May until Wednesday 27 June. Proposals will be on display online at www.glasgow.gov.uk/consultations and in Partick and Hillhead Library throughout that period. There will be drop­-in events from 3-7pm on Thursday 24 May (Partick Library) and 3-7pm on Thursday 31 May (Hillhead Library) where council officers will be on hand to answer any queries about the proposals. Byres Road will be transformed through a multi­million pound public realm project ­- funded by the Glasgow City Region City Deal -­ that will redesign the street to create a more attractive environment that benefits those who live, work and shop in the area. The design proposals have been developed after a number of very well­-attended consultation events in recent years, with representation from local residents, businesses and community groups. And here’s the official photo of this “utopia”, though you will see from the view at the beginning of this Digest that we don’t see it as quite as peaceful. Our members have been out on the street, online and in the media making the point that Paint is Not Protection. We are busy working up our official response and will put that out for you very shortly. This was in the last Digest (see Digest 9) but don’t forget that there are two consultation events at Bike for Good, Kelvinhaugh Road on 9th and 13th of June, see: https://yokecoco.wordpress.com/cycle-village-proposal/ for details. 3.1 Clyde Place and Tradeston – ongoing. We hope that there will be a positive outcome. We have seen word from Councillor Anna Richardson on social media that Sustrans funding has been secured for the Battlefield Rest junction, following recent public consultations. We are delighted by this news and are hopeful that this could lead to a link up with the nearby South City Way. We are yet to receive official notification of this but have been told that the redesign will bring improvements for walking, cycling and public transport, and extend towards Victoria Road, Langside Monument and Holmlea Road. The initial consultation and design phase will be starting soon and last a year. Thanks for reading and until next time digest friends, get those consultation fingers wagging!